We’re in a month of love, right? I’m not the biggest Valentine’s Day fan, but it is kind of cute to see some guy running down the street with cookies and a card. Or a couple arriving at a reservation-only restaurant before it opens – just to make sure, I guess. Valentine’s Day is cute – it’s easily digestible love. But the person I’m speaking with in today’s episode represents a different kind of love. This isn’t candies and balloons; this is self-sacrifice and commitment and hope. Today I’m interviewing Robert Capolongo of Staten Island New York. Robert and his wife Theresa, founded and sustain a nonprofit, raising a million dollars in the past few years to fight Duchenne’s Muscular Dystrophy, a debilitating disease that affects many boys, including their son. So let’s jump in to our interview with Robert of Michel’s Cause. MEGAN: Absolutely. Yeah, thank you so much for taking the time to speak with me today. I’m really excited to talk to you and to learn more about Michael’s Cause. ROBERT: Well thank you. Thank you for having me on. MEGAN: Absolutely. So, you run Michael’s Cause, which is a non-profit based out of Staten Island focused on raising awareness and funds to combat Duchenne Muscular Dystrophy. So, to start, can you tell me the story behind Michael’s Cause and how you went from a family dealing with a serious disorder to a family that started a non-profit? ROBERT: Yes. We started Michael’s Cause after my son Michael, at the age of four and a half, was diagnosed with Duchenne Muscular Dystrophy, which turns out to be the leading fatal genetic childhood disease that affects about one in 3,500 boys worldwide. We sought the best medical treatment throughout the country. His treatment is actually at Johns Hopkins in Baltimore now, where he sees a pretty well-known pediatric neurologist that takes care of him. After his diagnosis, we also learned that this disease is ultimately debilitating, it affects all the muscles in the body and finally the heart. It only affects boys and usually they lose the ability to walk by the age of 12 years old and then it starts affecting other muscles, ultimately the heart, which ends up making it a fatal disease. Historically, late teens and early 20s is the lifespan. It’s very tough for parents to deal with their little boy being ravaged by a terrible disease. So, we said, we want to try to do something to help, to raise awareness about a disease that quite honestly not many people know about. And, also to get funding to the best medical and scientific research to hopefully find better treatments and eventually a cure for this disease. Thus, we started Michael’s Cause shortly after his diagnosis and we do different events to raise awareness and raise funding, that’s pretty much why we started the foundation. MEGAN: When you first started, did you imagine it becoming as big as it has become? What were your first efforts that you made? ROBERT: Could never have imagined it coming to where it is today. I remember when we held our first dinner/dance gala event, I was afraid that we wouldn’t even have 200 people show up and a month before the event, we were completely sold out with over 500 people. We’re just humbled by the support. Since then it’s grown, our annual galas usually get 700 to 800 people each year just for the gala and we do different events throughout the year as well. Now that we’re going on six years of non-profit status and 501c3 status, we’re getting looked by bigger companies that want to help out and contribute to the cause. In the time since we’ve started Michael’s Cause, like I said, I always believed that if I raised $10 or $10 million dollars, I know where every dollar is going. I’m happy to say that we’ve raised well over $1 million in the time that we’ve done this and all the money goes to research. Today we have no salaried employees on board with us, it’s a volunteer, grassroots, non-profit that’s growing as we speak. MEGAN: I was looking through your website and all the different community fundraisers that go on. With Michael’s Cause, it really does feel like a community effort. Your website lists everything from $200 that was raised at a Middle School bake sale to $300 from another local restaurant or something. How did you build such local awareness in the early days and how do you think that’s sustained in your community? 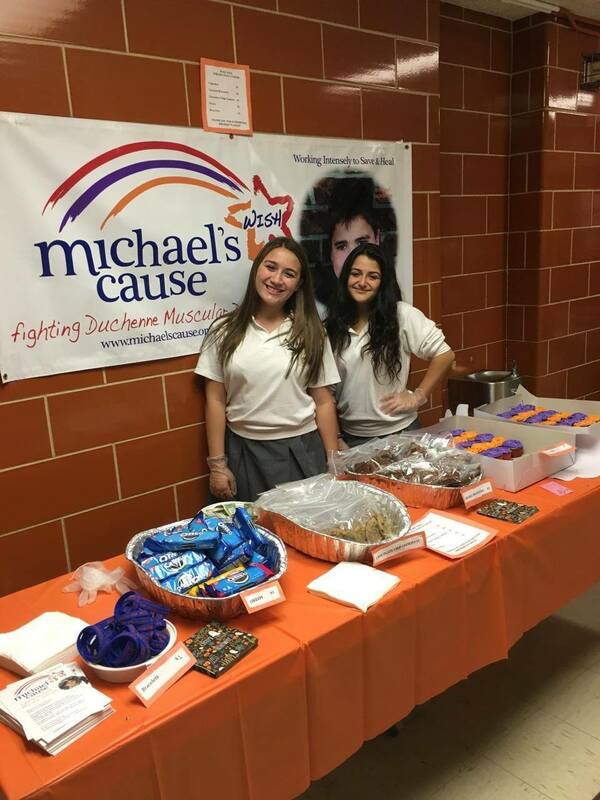 Local school fundraiser for Michael’s cause. ROBERT: Well, I always felt that when running a foundation, whether it be a non-profit or a for-profit business, you kind of have to be out there in front of whatever your cause is. I have no problem speaking about the unfortunate disease that my son is suffering from and I think that means a lot when it comes to people they can’t believe, oh you’re Michael’s dad and you’re out talking about it and raising awareness and raising funding. They find that to be remarkable. I just find it as second nature to me. I think that helped. In the community that we’re in here, which is Staten Island, New York. It’s one of the boroughs of New York City, so I kind of have an outreach to a pretty big population of people that have rallied behind the cause and what we’re all about. I fully realize that, obviously, our goal is to save my son’s life and other boys that have this disease, but realistically, the work we’re doing today may not help boys for two generations. So, we understand that, but it had to start somewhere. Fortunate for us, there are other non-profits in this field, in Duchenne Muscular Dystrophy, that are pitching in and helping out as well. Unfortunately, this is considered a rare disease, it doesn’t get a lot of funding like some of your mainstream illnesses: Autism and heart disease and cancers of different kinds that get a ton of funding every year. So, this needs money from the smaller foundations to get these drugs into the laboratory to see if they’ll actually work. That’s why we’ve funded just about $1 million now towards research. One of the things we funded is a human clinical trial and actually my son is in that trial, he was fortunate enough to get into the trial. All those things are, I think, can attribute to a community that cares and a community that rallied around to support not only one little boy, but a disease that affects so many thousands throughout the country. MEGAN: Yeah. It’s amazing. How is it for you and for family, your wife and for Michael, to see so many of your community members, so many of your neighbors, raising funds to help him and kids like him? ROBERT: It’s great, it really is. It’s remarkable to see and that why I think it’s so important that we recognize everybody. Whether it be a $5 donation or whether it be a $50,000 donation, every dollar counts with this disease. I think that’s the biggest thing. There’s different campaigns that are going on right now. One school here did a Dimes for Duchenne cause for Michael’s Cause, a Dimes for Duchenne fund raiser which was just asking the kids, hey any loose change you have and whatnot. They raised several hundred dollars just bringing in loose change. The thought of, hey we’re trying to rally around something to help and like I said, every dollar counts for sure. MEGAN: Yeah. And, another really interesting thing that you were talking about is that you don’t take any funds raised for administration or for overhead, you have a full-time job, you’re a police officer, right? ROBERT: Yeah. I’m a Sergeant with the police department here in New York and my wife is a registered nurse, so we both have full-time jobs. The foundation, Michael’s Cause actually seems like more a full-time job sometimes than my full-time job. But, this wasn’t about us raising money or collecting a salary or anything like that. I always felt that every dollar that we could put towards the research will bring us one step closer to better treatments and hopefully one day a cure. MEGAN: Yeah. Has it gotten harder as you’ve gotten bigger? I’m sure there are other non-profits that have this sort of, it’s almost like a Catch 22, because it’s like, well, if we could hire someone then maybe we could raise even more money. Do you ever deal with that? ROBERT: Yes, yes absolutely. We’re very close to that point, where for us to grow further, we kind of need that. We need someone on board with us, whether it be a salaried or hourly person to kind of help with some of the administrative functions. Some of the events that we run require a lot of solicitation to different businesses and banks and, also at the local level, stores for items to raffle off and auction off at our events and stuff like that. It’s gotten to a point where we’re so big now, in our sense, I say big, that it’s definitely becoming very difficult to manage. So, we’ll look to bring someone on in short order to help with that and I think in the long run it will help us grow even further, for sure. MEGAN: I’m sure it takes up, like you said, it feels like more of a full-time job than your actual full-time job. Does it take up all of your free time or do you have other–? 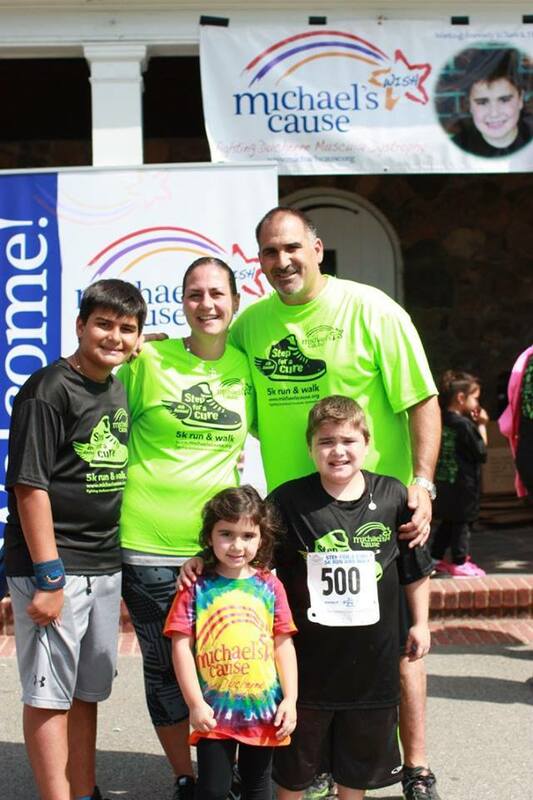 The Capolongo family at the 4th annual Step for a Cure 5K. ROBERT: It takes up a lot, but we kind of incorporate the family with a lot of the things that we do, and they look forward to some of the different events. We host a big 5K run and a walk in the fall every year and that actually has turned into a pretty big event where we get several hundred runners that actually run and compete and we get literally thousands of walkers that come and walk the event. The family is all involved with that. We have the face painters and the clowns and musicians and all kinds of stuff going on that day and it’s a nice family day. We try to keep everyone involved as much time as it takes away from other things that we could be doing, we try and make this the purpose for what we’re trying and they are totally supportive of it. It’s not easy, I have an older son who’s 12, two years older than Michael, and fortune for us that he wasn’t diagnosed with this disease as well. The disease is genetic, my wife was a carrier of it and never knew it, no family history. Fifty percent of the time there is no family history, meaning her mom did not have the disease or carry the disease. Then we have a little baby girl, who when we found out about Michael, he was four and a half and my wife was actually three months pregnant, fortunate for us it was a girl. Because again, this disease only really affects boys, girls become carriers. When the baby was born, my wife being a nurse, of course we banked the baby’s core blood, stem cells and placenta because that’s where a lot of the future therapies are going in stem cell research. So, like my wife said, this little girl is going to be the victory for Michael some day and the other boys that have this disease. Naturally, we named her Victoria. Although she’s five and she doesn’t quite know it yet, she’s going to hopefully save her big brother someday. MEGAN: That’s amazing. How are the stem cells—is it just that they can do a lot of testing on the stem cells? ROBERT: Well, stem cells, in and of themselves, when they come from a close blood relation, they’re a lot more viable than if it was trying to get them donated from somebody. Especially the core blood and the placenta and stuff like that is really important in the research that they are doing. Now, stem cells are being used in various diseases already and they do think that it’s going to have a lot of benefit in Muscular Dystrophy, which in turn will help others that have other muscle-born diseases, such as MS and different things like that down the line. We do thing it is going to be helpful, it is a few years away. Unfortunately stem cell research kind of goes on the funding that they get on a federal level which depends on the party that’s in office, unfortunately that’s just the reality of it. There’s been a lot of research the last few years because the democrats have been in office, they put a lot of money towards stem cell research. We’ll see how that goes now that the republicans are taking over the White House again, so we don’t know how it’s going to go long-term. But it is moving very fast, so we’re encouraged by that. MEGAN: That’s amazing. In a way that your family had some – you’re very fortunate that your wife is a nurse and that you have so many community connections because it’s helped you guys a lot as well. I can imagine that having a full-time job like we said and your wife has a full-time job, and raising three kids is a lot. And, managing a non-profit, if there is someone else who was in a similar situation and they were thinking of starting their own community non-profit and raising funds, what advice would you give them? Or, what advice would you give yourself five years ago? ROBERT: Well, I’ll tell you, I think that looking back and where we are now, I wouldn’t have changed that much. Because the heartfelt nature of our cause is that he’s living and breathing every day. He’s going to school and he’s watching the football games on Saturday. He can’t participate in many sports because of the nature of his condition, but he’s certainly an avid fan and because we have that and we see this little boy each and every day, that’s our driving force. He’s our inspiration. The support that we’ve gotten from the community, family, friends and various corporate level sponsors and so on have given us the drive to continue, and we’re humbled by the support we’ve gotten. That’s a credit to everybody that’s involved, our committee of people that volunteer their time to make the events run smoothly. The fact that the inspiration is Michael. Last year, our fifth annual dinner/dance, we give an inspiration award each year to someone who we feel that was an inspiration to us as a family, as a foundation. Last year Michael actually was the recipient of the inspiration award. When I tell you there wasn’t a dry eye in the venue. Everyone couldn’t believe it because we kept it a secret from everybody. When they saw him come walking out to receive the award, it was really a moment that I’ll remember and I think he will for the rest of his life. It was a special day and a special time and like I said, he really is the inspiration behind our cause, and other boys that have this disease like he does. MEGAN: That’s amazing. I feel like that must have been really special. When I have guests, I love hearing just a bit about their local area, because this podcast is all about the ecosystem of local. I feel like you have such a great perspective on Staten Island as a police officer and the beneficiary of some much local community kindness. How would you, in general, describe Staten Island, the community there? ROBERT: Staten Island is literally 16 miles long and it’s about a half a million people living in a small place. It’s a large population but it’s a small community, in the sense that everybody kind of rallies around certain causes and certain missions. For sure, that’s been the case for us. We’ve been able to touch people with story and the face the behind the story, which is Michael. People just jump in and want to help. Complete strangers will say, what can I do? 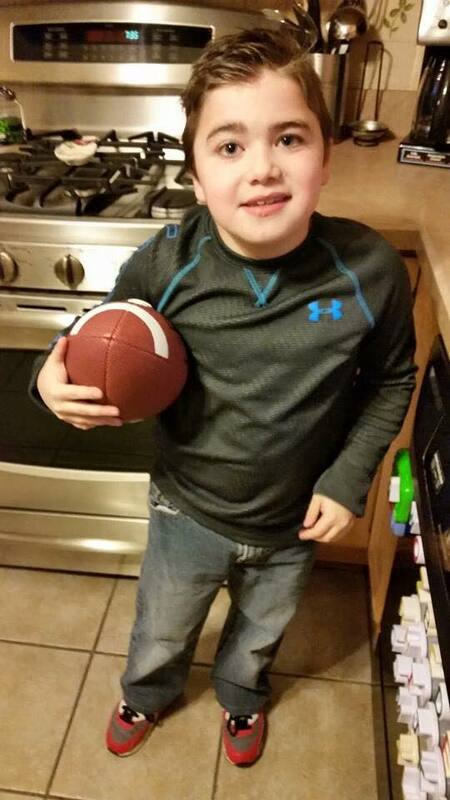 What can I do to help this little boy and fight this disease? It’s been pretty remarkable. Like I said, we’re fortunate that we have the outreach of a large population in a pretty small area, so that helps us. We’re in the local papers and on the TV and different ads that we run and stuff. Social media obviously helps a bit too. I think a combination of everything has allowed us to reach out and touch the entire community. MEGAN: Yeah, that’s awesome. Is there anything that I didn’t ask about that you would love to mention about Michael’s Cause or about your story in general? ROBERT: I think that even having the opportunity to speak to you today, we’re thankful for that. We’re thankful that you allowed us to tell our story and to tell about the mission that we’re on, to try to save not one boy, but thousands of boys that have this disorder. I guess that’s a credit to everybody that’s been involved with us to get to a point where you’ll reach out and say, hey we want to hear your story, that means a lot to us for sure. We thank you for that. MEGAN: You have a great story and you seem like a very committed and loving family, so it’s great to hear you story. Finally, how can people find you on the web? What’s your website? ROBERT: People can find us at www.michaelscause.org and we are pretty much available, like if someone calls, which our phone number is 917-443-5384, it will be either me or my wife answering. People like that as well, they like the fact that, hey you’re the president or vice president of the foundation and you’re answering the call? They can’t get over that and that will always continue to be. We’re behind the scenes, if I could take my name out of it, I would. This isn’t about me or my wife Theresa or anyone in particular, it’s about a cause that is heartfelt and we want to try and do something going forward to help all these kids for sure. MEGAN: Yeah, yeah. Well, Robert thank you very much for your time today, I appreciate it. Best of luck with Michael’s Cause.